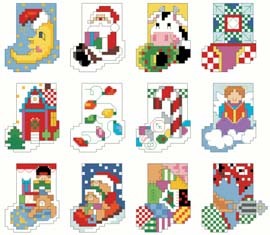 Twelve tiny Christmas Stocking designs are provided for you to stitch for Holiday gift giving or keeping for yourself. Make into ornaments or little holders for gifts of currency. They work up quickly and are appreciated by anyone.